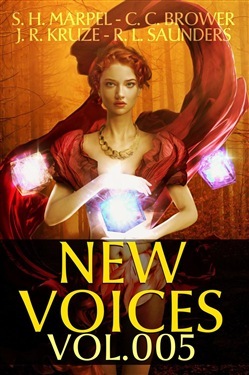 A collection of short stories from new voices - the cross-currents of mystery, fantasy, science fiction, and romance. Worlds new or perhaps re-visited - but only you will know if this is the stuff of dreams - or nightmares. Wolves that talk to nearly-extinct humans through their minds. Witches that not only represent the five elements, but also the five principles that can defeat all magic. Goddesses who have to work together to defeat a priestess who has mastered social media, and is threatening to use it to zombify the world. How an angel regained her lost wings by finding her true self. A female mechanical genius escapes her failure by learning the finer points of marketing - and its key single core basic. Satire that bites a little close to the truth of our modern times - the political theatre that turns deadly - and a woman witness who profits from her mis-statements about abuse, but loses all trust of the people around her... Anthology containing: When the Crow Calls by C. C. Brower Witch Coven Harvest by S. H. Marpel Freed by S. H. Marpel The Alepha Solution by S. H. Marpel Gaia by S. H. Marpel A Case of Missing Wings by S. H. Marpel & J. R. Kruse The Case of the Naughty Nightmare by J. R. Kruse On Love's Edge by J. R. Kruse Synco (TM) by J. R. Kruze & R. L. Saunders The Girl Who Built Tomorrow by J. R. Kruze Beltway Gremlin by R. L. Saunders The Lonely Witness by R. L. Saunders This massive collection of over 400 pages can keep you enthused and distracted for hours. And the ideas in these stories keep re-writing the stories in between your readings. A near-infinite resource to keep your entertained indefinitely (well, together with the earlier four volumes...) Scroll up and Get Your Copy Now. Acquista New Voices Vol. 5: Sep-Oct 2019 in Epub: dopo aver letto l’ebook New Voices Vol. 5: Sep-Oct 2019 di J. R. Kruze, C. C. Brower, R. L. Saunders... ti invitiamo a lasciarci una Recensione qui sotto: sarà utile agli utenti che non abbiano ancora letto questo libro e che vogliano avere delle opinioni altrui. L’opinione su di un libro è molto soggettiva e per questo leggere eventuali recensioni negative non ci dovrà frenare dall’acquisto, anzi dovrà spingerci ad acquistare il libro in fretta per poter dire la nostra ed eventualmente smentire quanto commentato da altri, contribuendo ad arricchire più possibile i commenti e dare sempre più spunti di confronto al pubblico online.